PYC bearing delivers the corrosion resistance and superior hardness of stainless steel in a wide variety of bearing types, ideal for applications in food/beverage, medical and other environments where moisture, corrosive or abrasive materials are present. AISI 440 Stainless Steel - Which exhibit excellent toughness and hardness properties and offer good corrosion resistance. This material is used extensively in bearing applications where precise tolerances and surface finishes are required. Common heat treating may be in accordance with MIL-H-6875. Stainless steel bearings are availabe in a variety of stainless steel material grade and compositions. Benefits of AISI 440c stainless steel bearings include: Withstand tough, corrosive conditions for extended service life, reduced maintenance costs and equipment downtime. In a semi-precision grade bearing, 300 series stainless steel can be chosen for improved corrosion resistance over 440C. These materials are not heat treated so load capacity is significantly less than HT 52100 & 440C. It can be used for both rings and balls or SS rings with ceramic balls. 300 series stainless steel offers excellent corrosion resistance to water and excellent to good resistance when exposed to certain common acids. This material can be an excellent choice for food grade applications. Other applications may include marine and vacuum processes. 300 series stainless steel is also a common material used for ribbon and crown type retainers. 300 series stainless steels are generally considered non-magnetic. Features :Stainless steel bearings can work well under such enviroment where is moisture, corrosive and abrasive. 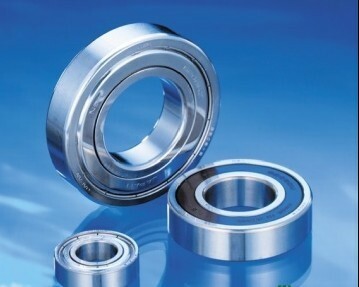 They are widly used for food and beverage processing machinery, medical appliances and medicine equipments.Some time they call it corrosion resistant bearings, waterproof bearings, underwater bearings,non magnetic bearings. Applications :Typical applications: electric motors, automotive applications, home appliances, industrial equipment.Food Processing Machine Optical Instrument Electrical Pump Medical Equipment Textile Machine Printing Machine.